as you know Spring has not yet taken hold in Vermont. 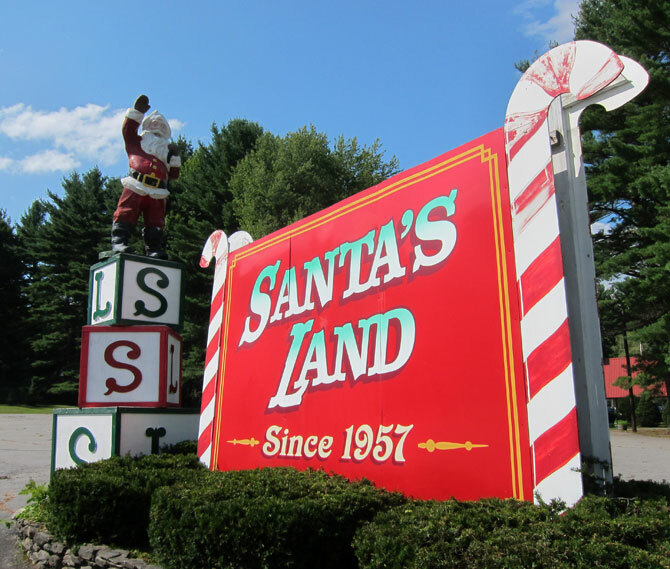 Santa Land Vermont now has a Facebook page – click here — visit now, and LIKE to get updates — I hope I am first in line tomorrow when it reopens. Yes, the good news is Santa’s Land USA will reopen after a number of years of being closed on Saturday November 25th. 10:00 AM – 4:00 PM. Same hours for Sunday November 26th. Santa’s Land will be open every Saturday and Sunday up until Christmas. To see my original 2013 post and images, scroll all the way down. 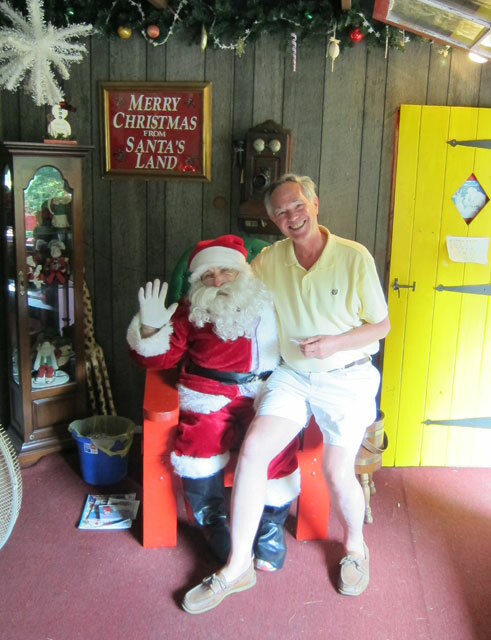 I stopped at Santa’s Land in Putney, Vermont today, hoping to catch the new owner. I found him and his teams hard at work. But he stopped work for a while touring me around, and chatting with me for news articles I plan. Below is David, our new “Santa” with the Santa from atop the main sign, and the second from his spot in the field near Rudolph. SANTA’S LAND will be open weekends November and December 2017 in celebration of its 60th anniversary. I am currently writing an article for October issue of THE WALPOLE CLARION that I publish, and would love to be able to provide similar articles to area publications – just contact me. Following are some images from my visit today. You may click on an image to get a full size slide show. Fences, and other repairs underway everywhere. 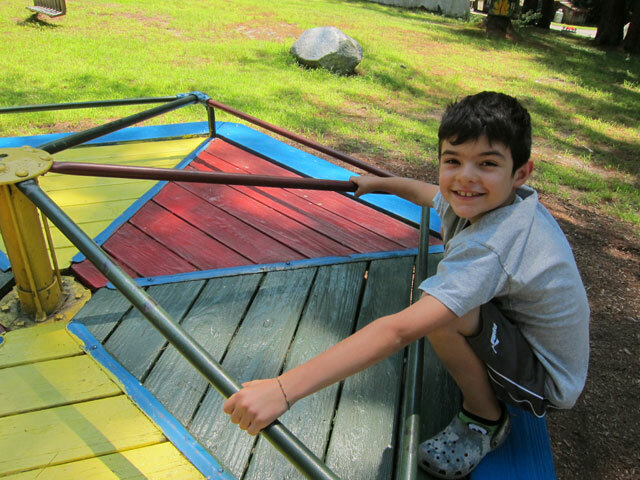 The sled house was totally repaired to its original leaning condition. The Iceberg Slide had been off-limits due to structural problems for years. It is now repaired and ready for the next generations of visitors. And the latest – 2 June 2017 – I received the below email from David (aka Santa) who plans to reopen this nostalgic piece of Roadside Americana for all to share and continue the memories. 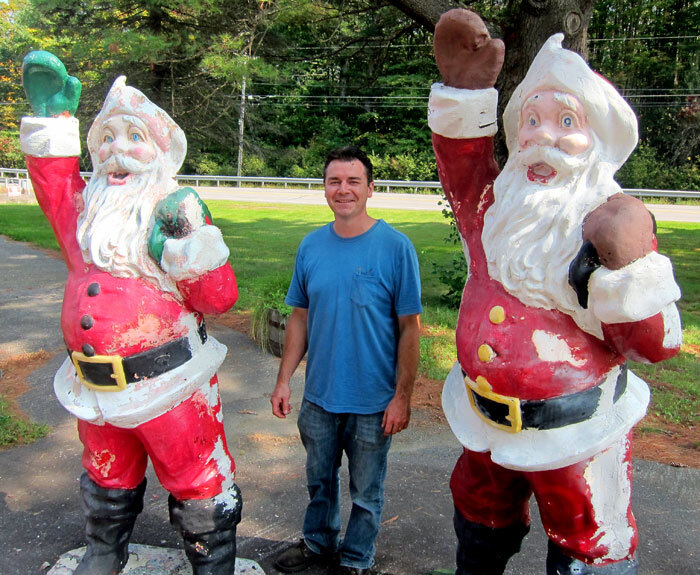 A strong attempt to restore and reopen Santa’s Land USA in Putney Vermont is in progress. Mother Nature and vandalism has taken a toll and we need a little push along the way. The link below is from Indiegogo, a funding page where friends and supporters can make a monetary donation. Please feel free to pass this along to those who may wish to help. Let’s keep the spirit and magic of Christmas alive. The Park may be purchased and reopened this summer. 9 February 2016 — spotted as I drove by heading south on US 5 (I should have taken a picture) — FOR SALE !!! So very sad. Not having been open in a year the “grandfather’s clause” allowing the park may have expired. The below was posted on Facebook at about 6PM – Friday 26 December 2014. I wish “Santa’s Land” my best wishes. I still think a devoted group needs to be formed to purchase and restore this historic place to its glory. In my many visits and chats, I do not think that Lillian can do it herself. I visited SANTA’S LAND in Putney, VT today, Saturday, December 20, 2014, and visited with Lillian. It has been a tough year for them. Today was the first day open, and I was the first visitor, and first customer. I bought a little tree for my collection, and she gave me a poster and pewter spoon. I hope this historic piece of roadside Americana can survive. Please visit tomorrow, December 21st and make a purchase. Here are some pictures I took today, hopefully another generation may enjoy Santa’s Land in Putney, Vermont. Click on any image to open a slideshow of larger images. My tree, and the poster and Pewter Spoon that Lillian gave me. The following was posted the afternoon of 3 August 2014 on SANTA’S LAND reactivated FaceBook page. Closed so far this season, it appears a birthday celebration will be held in the parking lot this coming weekend 9-10 August 2014. Please come join us Saturday and Sunday, August 9th and 10th for Santa’s 57th Birthday. 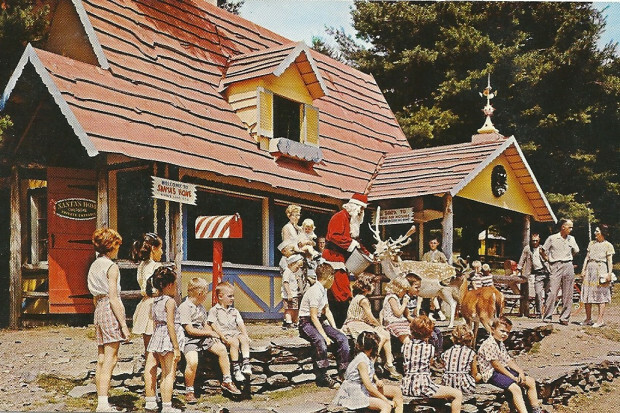 Santa’s Land was opened August 10th 1957. We will be having a celebration in our parking lot area with merchandise for sale, toys, ornaments, clothing and more. Santa himself will be here for all the boys and girls and everyone. This is a BYOP (picnic) event and/or tailgate party. Admission: children under 3 years old, free, anyone 3 years old and over, 5 dollars. Active military, National Guard and veteran’s free and military families half price. Please come support Santa’s Land and wish Santa a Happy Birthday!!! and pulled into the vacant, barren parking lot. Across the road, on the other side of US Route 5 was a peaceful group holding a myriad of signs stating “Boycott Santa’s Land” and “No Animal Neglect.” I have avoided posting the sorrowful news of the alleged animal neglect over the winter by the new owners, and will continue to remain impartial. I walked across the parking lot, past towering grass turning to hay, to peer into the entrance building. Looking through several windows I saw a shambles and wondered why they stated they were opening last weekend. Walking around the exterior fences it was apparent that the grounds were unkept and had not been attended to for a supposed opening. Chatting with the group on the other side of the old US Route 5, it was obvious that they all loved and cherished their memories of the now 57 year old park, but also were most cognizant of the alleged animal neglect since the season ended in December. I was told of their Facebook page Neglect at Santa’s Land, and have provided it as a link here so you too can follow what happens. So many of us love original Roadside Americana, and there is sadly little of this innocent fun left. Wouldn’t it be nice if a caring group could form a non-profit organization to purchase and preserve this little piece of Vermont for posterity? Stay in touch, but the group told me they will post the most current happenings at Neglect at Santa’s Land. Santa’s Land Facebook page no longer exists and their phone is not in service. 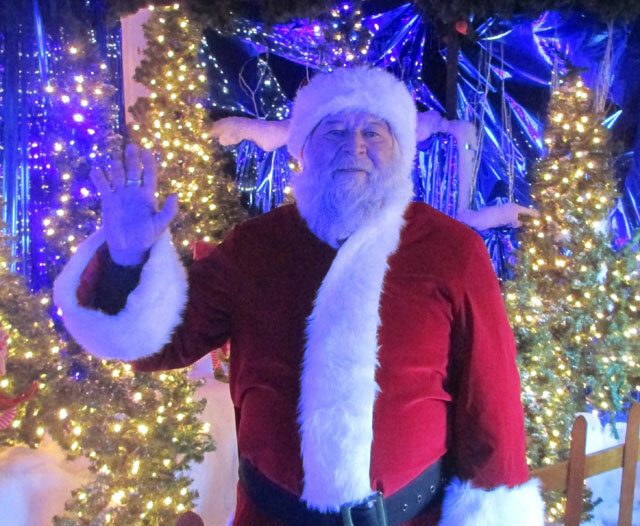 And click on this line to link to Santa Land’s Fan, Don’s post of his yearly visit. If you read no further: RAY RECOMMENDS – Visit Santa’s Land, Putney, Vermont, an original 56 year old roadside Americana survivor – by a hair !!! And, “vote with your dollars!” And, tell them you read about Santa’s Land on SHUNPIKING WITH RAY. Shortly after my dear-late Cathy and I moved to New Hampshire in 2002 we saw an article that SANTA’S LAND, since 1957 in Putney, Vermont, was for sale. We dreamed – Cathy shared my love of Shunpiking and roadside Americana, but that was not the direction we were headed. It was sold and saved. Shortly after, grandson Alex (now going on eight) was born, we visited before Christmas one year with Alex, David and Mari. It was fun. Yesterday David, Mari and Gary came up from outside Boston to bring Alex to visit with Grandpa Ray (Yes, I know I do not look old enough to have a grandson) for a yet to be determined number of days. We have a full schedule, much of which is tradition – based on things we did during his visit last year. Mari and David mentioned that visit to Santa’s Land years ago, and Alex’s ears perked up. I had passed last Sunday and saw cars in the parking lot, but not sure of the open days checked the website. Website was not functioning (I learned today revamping is in progress). David was surprised, “gee, Dad, what a smart idea to use the phone and call them.” The message said, “Open 7 days until Labor Day, then weekends until Christmas. Admission $10 – Veterans FREE (gee, my 22 years active duty US Navy qualifies).” Open, and on today’s agenda!!! Shortly after lunch we headed over in BLUE BELLE (1960 MGA Roadster for my first time visitors) for the maybe 15 minute trip heading down US Route 5. I love US Route 5 through Vermont and Massachusetts – the old road replaced by high speed, limited access and boring I-91 (remember my report of Dinosaur footprints?) but I do love cruising on un-crowded I-91. We parked under some trees (intermittent rain expected) along with a few other cars. I showed my US Navy Retired ID when we entered, and not only was my admission free, but Michael cut Alex’s in half – $5 for an afternoon of fun!!! Not again, I will not accept this, I want them to continue for generations!!! Well, my gallery of pictures (remember to click on one to enlarge and to browse them all) will give you a flavor of the treat that awaits you. After a couple of hours a young man (25 – much younger than me) came up as the rain was beginning and said, “you are the one with the sports car with top down, the rains are coming.” “I am not worried, nothing bothers me anymore,” I replied. Alex and I had just gotten ice cream, and posted on the window at the snack stand was a Brattleboro Reformer article from a few days ago reporting on the recent sale and reopening of Santa’s Land. I had no idea! And, Johnathan (yes with an initial second h – not a typo) who came up to talk to us was one of the new owners. One building in the village. A collection of old Santa’s Land souvenirs in the train station. Alex heading down the slide. What fun I had talking with him, and learning of his families’ new passion. We continued visiting through the light rain while the other folks departed the park. I then visited with Santa, Alex (now alone in the park) enjoyed the slide some more, and as we headed to the exit we visited with Johnathan again, and saw BLUE BELLE with a cover over her – his brother had covered the cockpit with sheets. I then thanked Michael (Johnathan’s brother) as we exited through the gift shop, and as we were leaving the parking lot Lillian (their mother) came running up to flag us down along with her sons. We chatted, and I told her I wanted to do whatever I could to ensure their success. So, please visit (if only to take a picnic lunch to savor under the pines on one of their picnic benches), bring your distant nieces, swim team, children, grandchildren, etc. Now, Alex has been raised in the plastic Disney generation but loved our four plus hours there. And he cannot wait to go back in a few days – but maybe that was because Johnathan promised he would wax the slide for Alex. 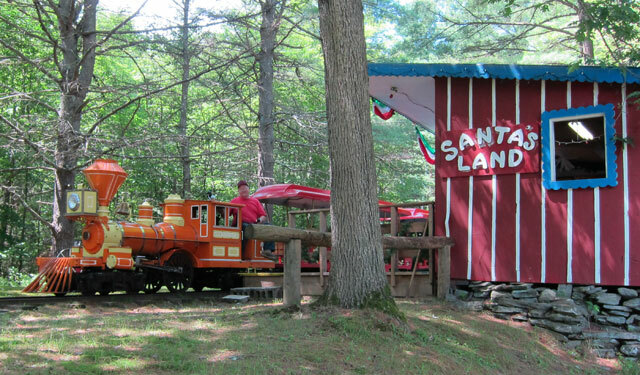 So, again, RAY RECOMMENDS: Hurry to Santa’s Land in Putney, Vermont, enjoy your nostalgic day, and spread the word. Let’s keep the simple life alive forever!!! 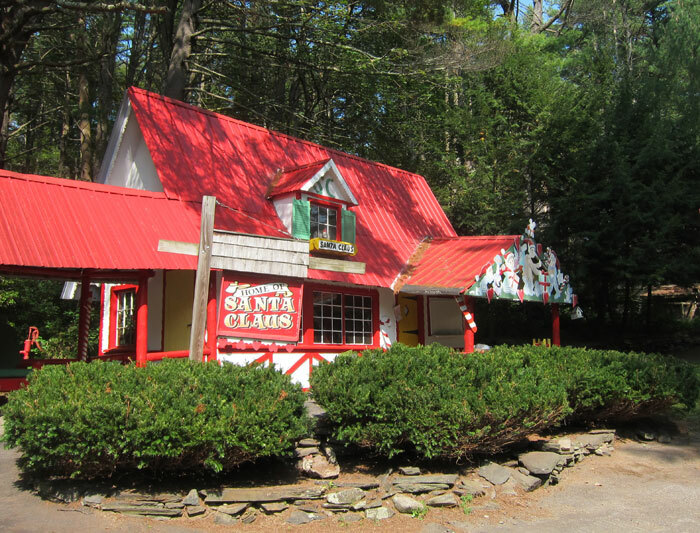 On July 7, Santa’s Land was reopened to the public for seven days a week until Labor Day. After that, the park will be open weekends until Christmas. 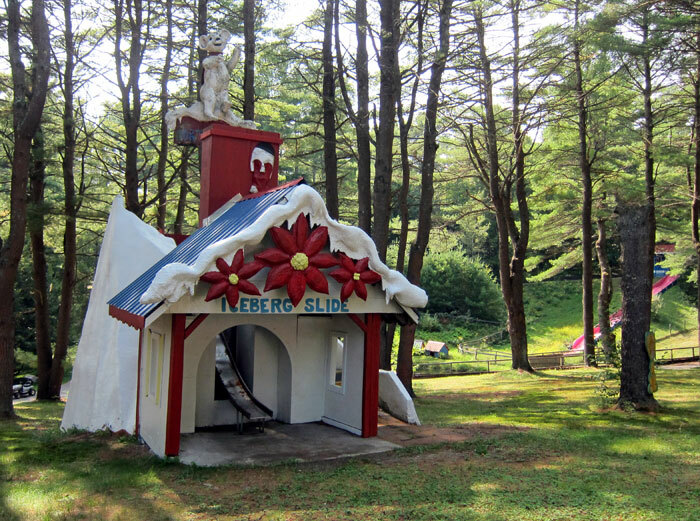 Billewicz had been following the story of Santa’s Land since December 2011, when the park was about to be closed forever. She went to the park in February 2012 to check it out. It was zero degrees outside. In a buggy, she was driven around the 42-acre property in snow and sleet. Billewicz told previous owners Tim and Lesley Wells that if they ever wanted to sell the park, they should contact her first. Billewicz was never notified. In the fall of 2012, she saw Santa’s Land was up for auction and it triggered a maternal instinct. “I said, ‘No, no, no. That’s not going to happen,'” Billewicz recalled. The following two weeks, she and her two sons, Johnathan and Michael, began their attempts to save it from going to auction. One of the major reasons for not wanting it to go to auction was that Santa’s Land was included in a grandfather clause for zoning that it would lose if it went out to auction. The grandfather clause also stated that the park couldn’t be closed for longer than a year. Since it was closed in 2011, it had to be reopened in 2012 or the grandfather clause would be lost. The doors were open but ownership was still up in the air. Volunteers met through Facebook on the “Save Our Santa’s Land” page and the doors stayed open for a short time during 2012. From January up until a few weeks ago, the Billewicz family has been in contract negotiations. Since acquiring the park, friends and family have come up to the Putney property to assist with revitalizing some of the buildings and thoroughly cleaning the park. PPS – Next month I will report on this fantastic find in my THE WALPOLE CLARION. Sadly this discovery came a day after we sent the August issue to press. This entry was posted in Santa's Land and tagged nostalgia, Putney, Roadside Americana, Santa's Land, Shunpiking, VT. Bookmark the permalink. I’m almost embarrassed to admit it, but I was once an elf working at Santa’s Land! (In my youth, lots of Vermont kids worked there for the summer). Do they still have animals there? There were lots of animals when I was there, which for me was the best part, except for a violent chimpanzee named Jingles that they kept away from the public. The worst part of the job was having to listen to Christmas Carole’s 24/7, and working in an unseated gift shop in December. Oh, the memories. Thank you for sharing Chris !!! Yes, a few animals there. Lllamas, goats, Emu, deer, lots of deer. Let’s save SANTA’S LAND !!! Great time for Alex. Glad you thought of it and made a wonderful day for both of you. Did you tell Santa what you want for Christmas? SANTA”S LAND – There are pictures somewhere in a family album ! I was a young child then! So great, cant wait to see it when it opens, been waiting a while. My kids made it there a couple times before it closed.